Despite the GOP's opposition to extending unemployment insurance to millions of America's long-term unemployed, House Republican leadership is hoping to persuade Americans that rank-and-file members aren't heartless and uncaring. How? With a memo, of course! According to a report from the Washington Post, House GOP leadership on Tuesday sent its members a memo outlining ways for Republicans to talk about unemployment insurance, and the long-term unemployed, without sounding so much like a bunch of Scrooges. "For every American out of work, it's a personal crisis for them and their family," the memo reminds House Republicans. It next argues that House Republicans have passed "dozens" of "jobs bills" that have gone ignored by Democrats in the Senate. "Washington has lost its priorities if it's more focused on making unemployment easier to tolerate than it is getting people back to work and restoring independence all together [sic]," reads the next bullet point. 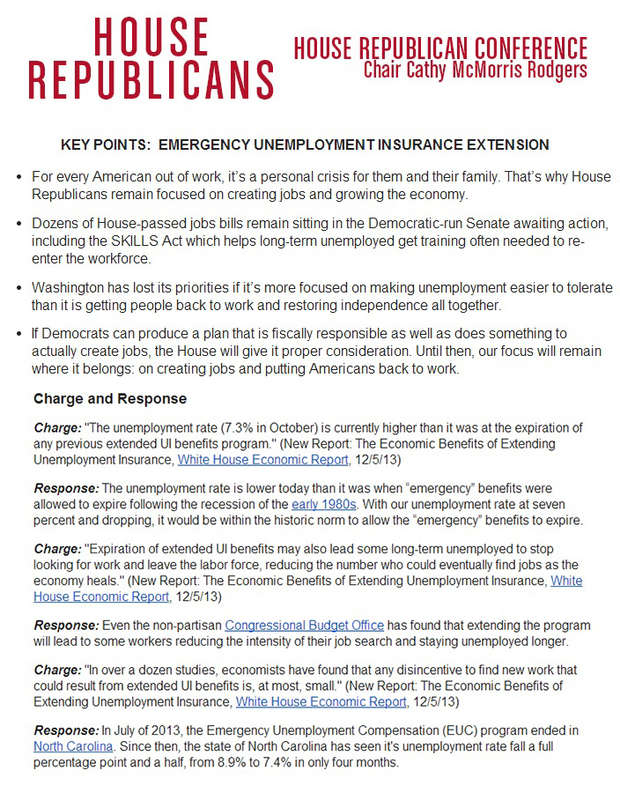 The last bullet point reiterates the GOP's standard talking point, saying Republicans in the House will give "proper consideration" to any plan to extend emergency unemployment insurance — provided it is "fiscally responsible" and "does something to actually create jobs."